In a previous post, we spoke of Horace Walpole’s 1764 novel The Castle of Otranto as, effectively, ‘the forgery that began Gothic literature’. Another important forgery from the 1760s was the work of an adolescent, Thomas Chatterton. Born in Bristol in 1752, Chatterton started writing poetry at an early age, and by the time he turned 12 he had already written his first ‘medieval’ poem – the twist being, of course, that the poem wasn’t medieval, but eighteenth-century in origin. Chatterton has a serious claim to being the most precocious English poet who has ever lived. In his early teens, he fell in love with all things medieval, and invented the figure of the fifteenth-century monk Thomas Rowley, who would become the teenage boy’s alter ego. Thereafter, Chatterton would write the majority of his poems as Rowley, and even succeeded in passing them off as genuine medieval poems … for a while, at least. He struggled to find a wealthy literary patron to support him: he sent some of his Rowley poems to Horace Walpole, but – ironically, given Walpole’s own fabricating habits – Walpole decided against publishing Chatterton’s ‘found’ poems because he suspected they might be forgeries. Travelling to London in the hope of finding financial recognition there, Chatterton failed to make a living as a writer, and at the age of just seventeen, in August 1770, he committed suicide by poison – a phial of arsenic – in his Holborn flat. The 1760s were also witness to another great literary forgery. One of the more notorious forgeries of the 1760s was perpetrated by James MacPherson, a Scottish writer and politician, who in 1765 (the year Walpole owned up to the authorship of his ‘found’ manuscript The Castle of Otranto) published The Works of Ossian, a collection of Scots Gaelic poems he claimed to have found and translated. (Ossian is supposed to be Oisin, also known as Finn McCool, the legendary Irish figure.) In fact, it appears MacPherson had made up much of the content of the poems, and the debate about their authenticity continues. The Ossian poems went on to have a considerable influence on the Romantic movement later in the eighteenth century. One of the more lasting legacies of the poems was the name Fiona, which MacPherson appears to have ‘invented’ in the cycle of poems. As for Chatterton, his tragically early death helped to immortalise him as a sort of patron saint of the Romantic movement in poetry. His work, and life, went on to influence later Romantic poets such as Wordsworth and Keats, who both wrote poems about him, and novelist and biographer Peter Ackroyd wrote a novel about the poet, Chatterton, published in 1987. Victorian poet Robert Browning borrowed the word ‘slug-horn’ from Chatterton’s pseudo-medieval poetry for his famous 1855 pseudo-medieval poem ‘Childe Roland to the Dark Tower Came’ (which in turn influenced Stephen King’s Dark Tower series of books). More recently, J. K. Rowling has put the slug-horn to new use, in the name of Horace Slughorn, a character from the Harry Potter series. Cool post! Thanks for the follow! Thanks! And no problem – I’m loving your blog. There’s a brilliant essay on Chatterton in “Sidetracks – Explorations of a Romantic Biographer” by Richard Holmes. Thanks for perusing – and liking! – my post on “Incomprehensible Verse”. Thanks for the Richard Holmes info – will seek it out! Chatterton found his inspiration for those poems in a room above the unusual octagonal porch at St Mary Redcliffe, where he copied the medieval script from original manuscripts to give credence to his forgeries. The house where he was born was still standing when I left Bristol nearly a decade ago, but even though it was administered by the City Museum I never found it open, so can’t vouch for any atmosphere it might retain! 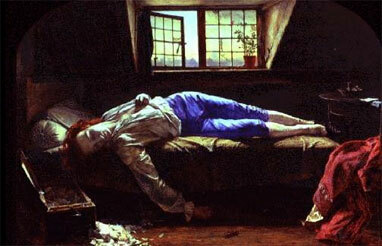 The most famous of the pictures of Chatterton, in Tate Britain, portrays his supposed suicide (though it could have been an overdose to treat an STD). Anyway, I digress. I tried reading his poetry when I was younger but found it indigestible; I may have been just too immature to appreciate it.